This summer the Wooster Tree Ring Lab is funded by the College of Wooster’s Center for Entrepreneurship to date buildings of historical interest using tree rings. 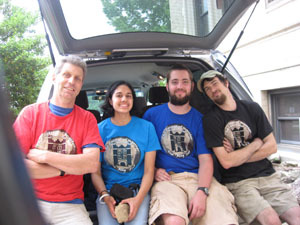 The crew in this endeavor is shown above and includes – Dr. Greg Wiles, students Kelly Aughenbaugh and Colin Mennett, and Nick Weisenberg who is a timber-framer and works in building restoration. The demand for our service has been excellent and is concentrated in the Pittsburgh area, locally in Kidron, Ohio and now in the Cincinnati area. We can use our archive of tree-ring data and lots of hard work by our staff to tell homeowners, folks at historical sites, historical archaeologists etc. the year timber was cut prior to building the structure. The tools of the trade are shown below. We will tell you a bit about the results of our work soon. 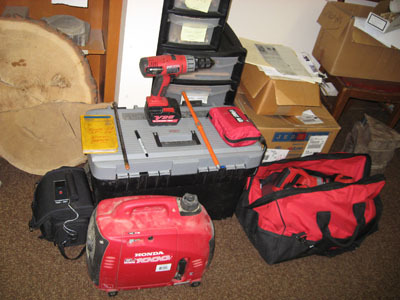 Below: The gear pile includes standard powertools and generators along with specialized dry wood bits. Nick illustrates the proper coring technique. 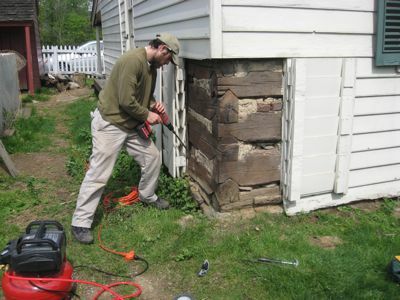 This historic building is Woodville PA – the oak beams that he is coring were cut in the fall or winter of 1785. STARAYA LADOGA, LENINGRAD REGION, RUSSIA–This place, known as “Old Ladoga” is where the Russian state began. It is an important trade junction situated on the Volkhov River not far from where it enters Lake Ladoga. The Viking roots of this country are dramatically evident in a series of eighth to tenth century burial mounds on both banks of the river. 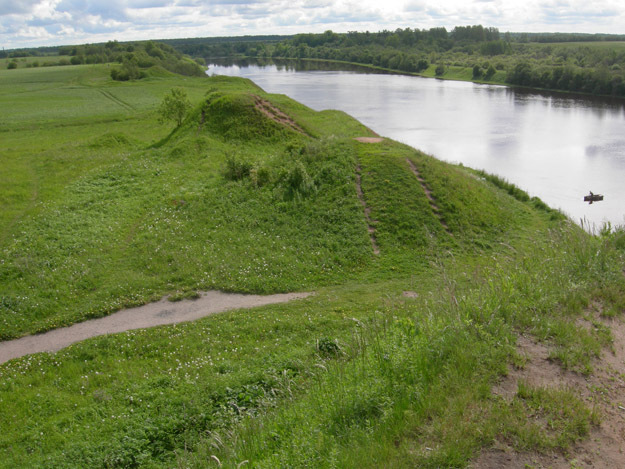 Viking burial mounds along the Volkhov River. One of these mounds, the largest, is reputed to be the grave of Oleg, the most vigorous of the earliest rulers. I couldn’t help juxtaposing it with an image of a German World War II helmet we found nearby. The hand of history lies heavy on this fertile land with broad rivers and no other natural defenses. Oleg's Mound (reputedly), and a German World War II helmet found in the woods nearby. This site was fortified for centuries. 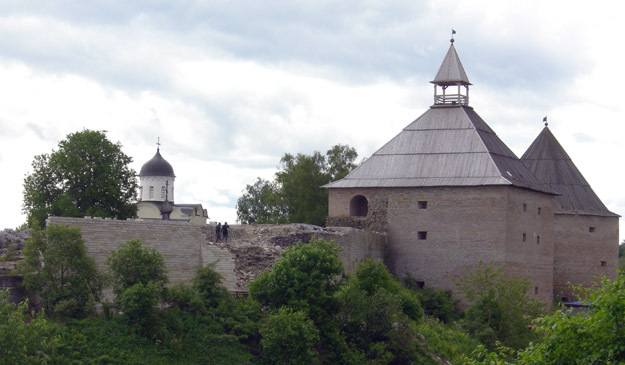 The current manifestation is the Ladoga Fortress from the 17th and 18th centuries. It protected a river crossing and controlled navigation on the lower Volkhov. Unfortunately virtually all of the original fortress was destroyed in WWII, so what you see above is a reconstruction based on pre-war maps and photographs. 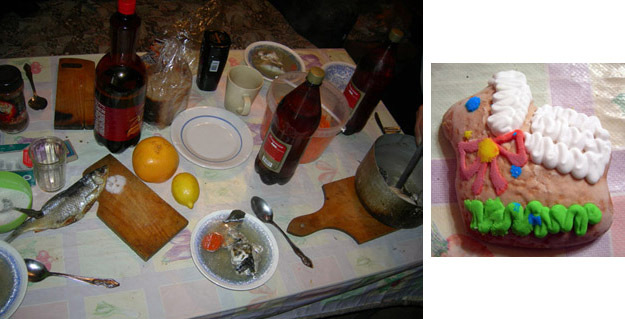 NEAR KHAMONTOVO, LENINGRAD REGION, RUSSIA–Like most American travelers, I worry most about foreign food and bathrooms. The food, at least, turns out to be delightful. One of our many dinners in the field house; a Trinity Sunday cookie. Our field day usually starts with food shopping. We buy fresh and smoked fish from roadside vendors and other items from small stores in the local villages. For some more elaborate dinners we take the ingredients with us in the car and at slow moments someone pulls out the pot and slices meats and vegetables! 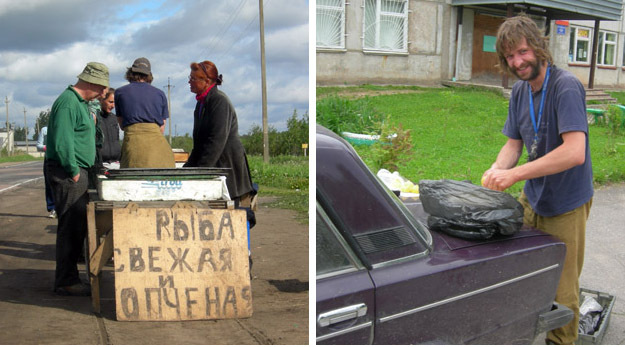 Buying smoked fish on the way to the field on the left, and Andrei preparing for the night's dinner on the right. SYAS RIVER, LENINGRAD REGION, RUSSIA–The main geological attractions for me on this expedition are the abundant carbonate hardgrounds in the Lower and Middle Ordovician in this part of the world. A carbonate hardground is a cemented seafloor. What were soft sediments on the bottom were cemented with carbonate minerals (calcite in the Ordovician) so that they became a rocky surface several centimeters thick. The sediment is usually carbonate mud and shells, so the result is essentially a limestone seafloor. Many invertebrate animals colonize these hard surfaces by wither encrusting them or boring into them. Those eocrinoids illustrated earlier, for example, often encrusted Early and Middle Ordovician hardgrounds. Today at the Syas River Carbonate Mound locality (N60.02316°, E32.62471°) we saw numerous hardgrounds bored by a shallow variety of a trace fossil called Trypanites. Borings in Ordovician hardground fragments. These are the most common borings in hardgrounds. 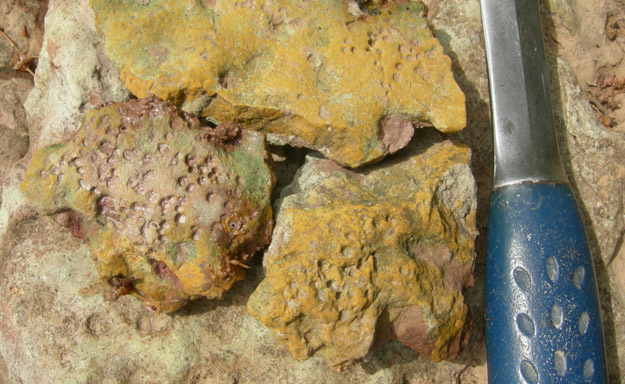 This particular type of Trypanites is remarkably shallow — often appearing as pits rather than the usual penetrating cylinder. Another difference between these hardground fossil faunas and those I know best in North America and western Europe.